Glutamine is the most abundant amino acid in muscle tissue. During workouts, your body depletes its glutamine reserves. So, to avoid muscle degradation and optimize recovery, we recommend a high-quality L-glutamine supplement. Stay clear from muscle catabolism and speed up your muscle recovery at the same time. You just need to add Firm Foods Glutamine to your supplementation and you can quickly replenish your glutamine reserves. Maximize muscle growth and repair by adding glutamine to your post-exercise nutrition. For top quality glutamine support, try Firm Foods Glutamine 500g! * Apart from its benefits in sports nutrition, glutamine supplementation can also be used as an aid for intestine health, for immune support, and to naturally help increase growth hormone levels. 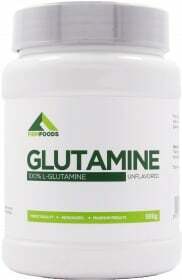 Have a question about Glutamine? What is it, what does it do, how and when to use or something else? Ask us. 0 out of 0 found this information useful. There are no more reviews in English Would you like to see reviews in other languages? Mix 1 serving (5g) in 250ml of water or your beverage of choice. Consume twice daily, preferably post-workout and before going to bed. WARNINGS Glutamine : Do not exceed recommended dosage. Keep out of reach of children. The product should not be used in case of hypersensitivity or allergy to any of the ingredients of the formulation. Food supplements should not be used as a substitute for a varied and balanced diet and healthy lifestyle. Store in a cool, dry place. Please Recycle. BEST BEFORE: Please see lot number and expiration date stamped on the packaging.